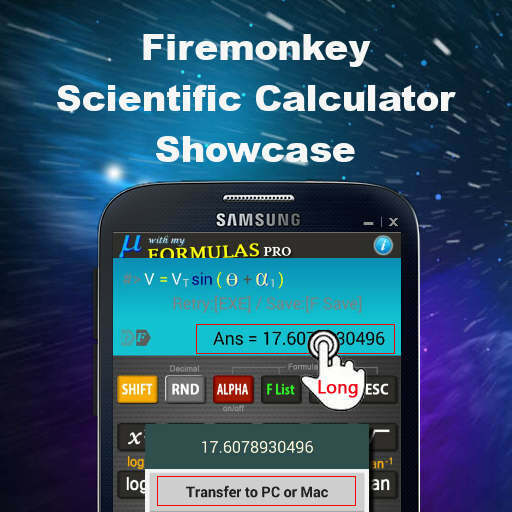 Developer SangHyun Oh from Korea wrote in to showcase his scientific calculator app which was built with Delphi XE6 Firemonkey. The app is called Scientific Calculator Mu and is available on both the Apple App Store and Google Play. There is a free Lite version and a more advanced Pro version. It’s main feature is the ability to create and run your own formulas which are almost exactly identical to the mathematical equations. The functions that the formulas support are power, root, log, trigonometric in degree and radian, arcsine, arccosine, arctangent, factorial, and various hyperbolic functions. There is also a partner desktop application which goes with the app that allows you pair your Android or IOS based app with your Windows or Mac OSX desktop via Delphi XE6 App Tethering to instantly have the results from your calculation on your desktop. Your mobile device becomes an extension of your desktop with this feature. There is no source code available but it looks like a really nice implementation using of lots of the latest features that Delphi XE6 Firemonkey has to offer. Head over and check out the full blog post about the main Scientific Calculator Mu app and then download it from your app store. Head over and download the App Tethering version of the desktop app and pair it with the Scientific Calculator Mu mobile app.